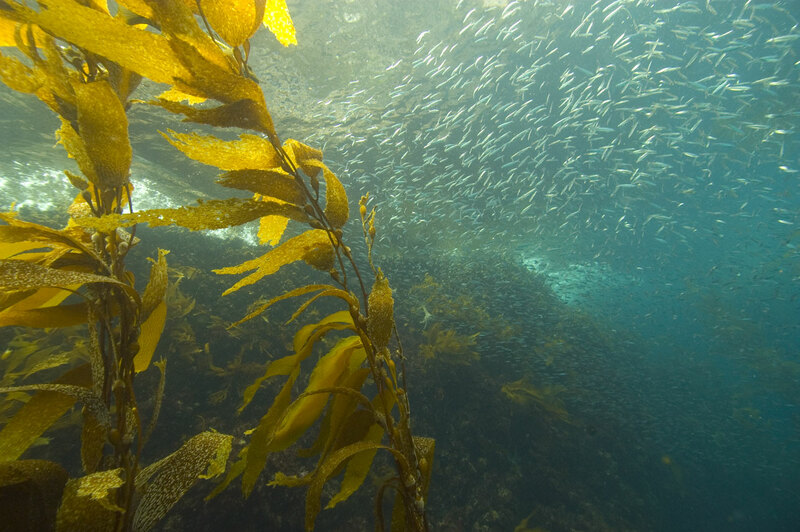 Less-productive marine plants will crumble food webs from the bottom up. The consequences of climate change are emerging in more visible and more disastrous ways. From climate refugees to diminishing habitats, it seems as though just about every species on planet Earth is suffering as a result of our changing climate. One new study bears the latest grim news, showing that climate change could cause the collapse of marine food webs by restricting the energy that flows from producers to herbivores to carnivores. The research was conducted by scientists at the University of Adelaide and published January 9 in the journal PLOS Biology. Their work shows that increasing temperatures restrict this sustaining energy flow, as do increased levels of dissolved carbon dioxide (CO2), which lower ocean pH in a phenomenon called ocean acidification. To come to this conclusion, the research team used an “advanced mesocosm” approach. The team set up twelve large, 1,800-liter tanks simulating various ecosystems around South Australia. They populated these model ecosystems with a variety of species to create realistic mini-food webs, and then altered groups of three tanks to one of four treatments: elevated temperature, elevated CO2, elevated CO2 and temperature, or a control, using the normal summer conditions of South Australia over the past 5 years. The elevated temperatures of +2.8° Celsius (5° Fahrenheit), and a CO2 concentration that brought the water pH down to 7.89, mimicked the conditions predicted for the end of the 21st century if the planet continues on its current rate of greenhouse gas emissions. To create the food web model that led them to their final results, they observed and measured the survival, growth, biomass, and productivity of all plants and animals within the tanks for six months. They found that higher temperatures limited the flow of energy from producers to plant-eaters, while the combination of increased temperature and increased CO2 both decreased energy flow from plants to their grazers and from plant-eaters to predators. This is largely because warmer temperatures increased the productivity of inedible blue-green algae at the expense of marine plants, which form the vital base of the marine food chain. This waning energy suggests that top consumers could be left with dwindling food resources under climate change. Less productive marine plants will mean less energy is passed to plant-eaters, which will slowly dwindle the population of these grazers for predators to eat up the line. This could lead to a cascade of negative effects for a great many species. Just as adequate producers are an important part of any food web, so are the top predators, which remove sick or injured animals and keep overpopulation in check. The research team concluded that given their drastic results, this type of research must continue, and with even larger and more advanced mesocosm approaches and models. The better we understand how the changing climate will affect these webs and ecosystems, the better we may be able to take action to make these systems more resilient against the change to come.